Considering a trip to Disneyland but you’d have a baby on board? You might be asking yourself, “What can babies DO at Disneyland?” No need to cancel your travel plans, babies are quite welcome at the Happiest Place on Earth! 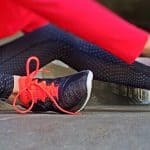 There are a few things you should know first. 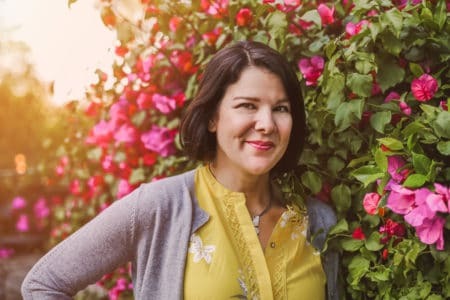 I have the answers to the top four questions most parents ask themselves before bringing a baby to Disneyland. What Can Babies Do at Disneyland? 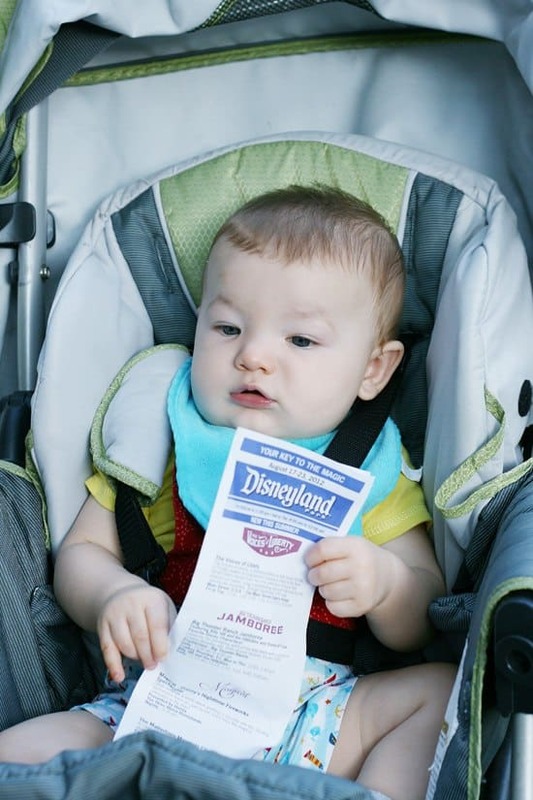 You might be wondering if it’s worth it to take a baby to Disneyland? I’ve been taking my babies to Disneyland for YEARS, so I’m here to share my insider tips about your concerns. I’ve even traveled alone with my baby to Disney! What can you do at Disneyland with a baby? What rides can babies go on at Disneyland? Should we just hold off any Disney vacation plans until our baby is older? My son’s first Disneyland trip came at 8 months old. My daughter was only 5 months old! I can attest that we all had a wonderful Disney day, even with the baby on board. Certainly it’s not the same kind of day you’d have with just older kids but it’s still fun all the same! The most important thing is to be prepared in advance so everyone in your group knows what to expect. Know that you might have to take more frequent breaks for diaper changes and feedings. However Disneyland is quite well equipped to handle all guests, babies included! He has his Attraction Guide and he’s ready to go! 1. What Can Babies Do at Disneyland? 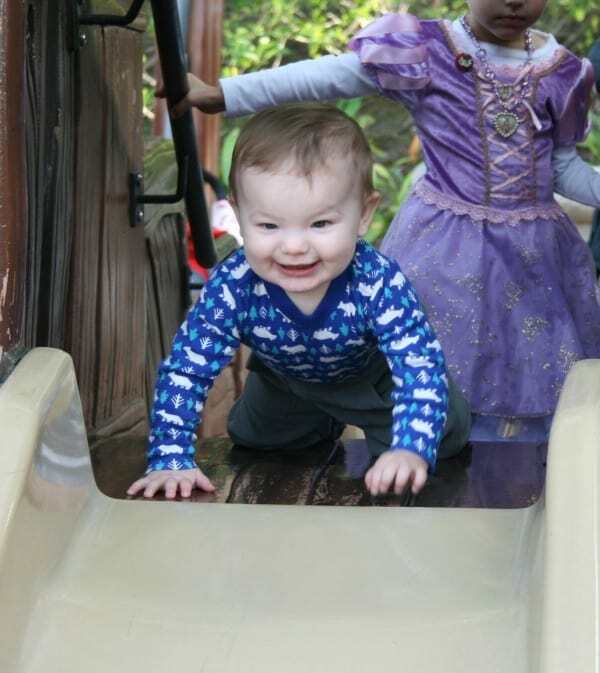 Depending upon the age of your baby, you can do a lot together at Disneyland! 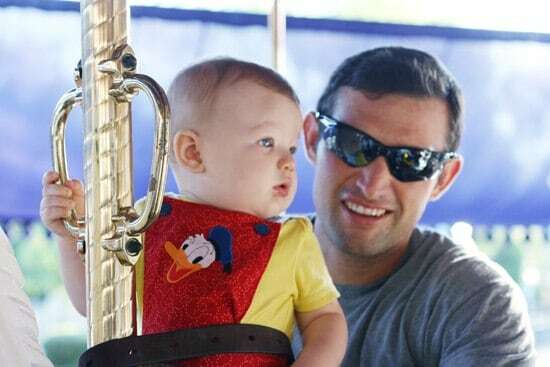 Even the very youngest guests can still be with their family on many of the rides. 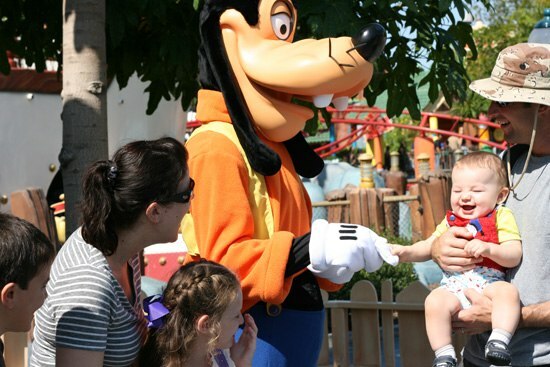 Here are a few other things that babies love to do at Disneyland. Many babies love the character engagement, as my little one did. 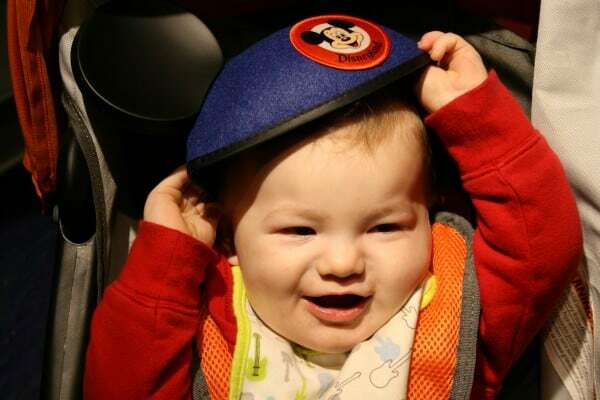 Dillon laughed when he met Goofy at 8 months old, giggling and waving at him! He adored Minnie Mouse (and her nose!) And when he met Pluto at 11 months old, he toddled over and Pluto jumped around on his paws to make Dillon laugh. 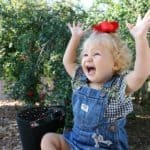 The characters are exceptional with little ones and will tailor their behavior to your child, especially if they see that your baby isn’t receptive or upset. Parades are fun and colorful and can be quite entertaining for babies who can sit up and watch from their stroller. Babies are welcome at all shows as well. My son enjoyed watching Mickey and the Magical Map as a baby, since the show was vibrant and had enjoyable music. During the Frozen: Live at the Hyperion show, I was able to nurse my daughter and she took a long nap! The Disney Junior: Live on Stage show is perfect for little ones and they can toddle around the room, dancing to the music. 2. Can Babies Go On Any Rides at Disneyland? Babies can ride nearly everything in both Parks, give or take about 20 rides with height requirements. I recommend taking both a stroller and a front carrier as you can hold baby in a front carrier on many of the rides. My little ones loved it’s a small world, The Many Adventures of Winnie the Pooh and The Little Mermaid – Ariel’s Undersea Adventure. Anything relatively slow moving, musical and colorful will likely be enjoyed by babies. 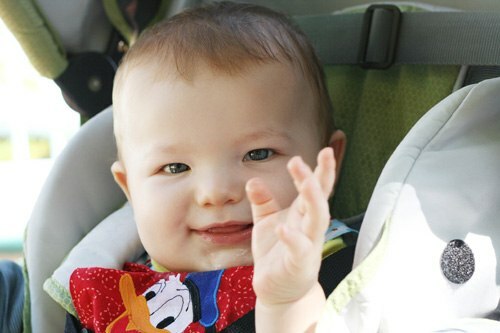 For rides that baby can’t go on, take advantage of Rider Switch Pass, a free service. This allows those who meet height requirements to ride while one person stays behind with the baby. Then the riders “switch” places so the person left behind can ride too. The Disney Parks Moms Panel covers the topic of Rider Switch Pass in detail. My husband and I take turns waiting with our baby. If your baby is beginning to toddler, there are some play areas (like Goofy’s Playhouse in Toontown). The play areas may not be appropriate for non-walking babies so take note before you let your baby down to crawl or explore. Keep in mind that some rides and attractions have loud noises that might frighten your baby (Jungle Cruise gun shot comes to mind!) Just ask a Cast Member at the entrance if you have any question that the ride or show might not be appropriate. Use ear protection for your baby if you need to. 3. What Should We Bring to Disneyland For the Baby? 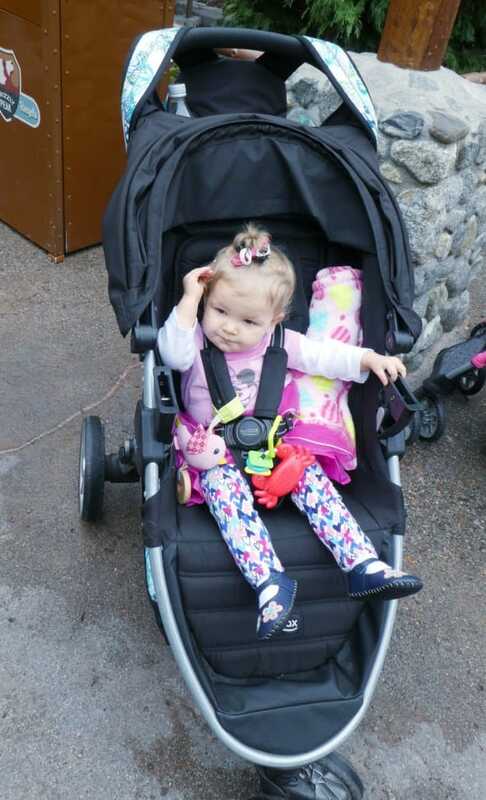 If you can, bring your own stroller to the Parks. The walk to the car or hotel after a long day can be hard, especially if you are lugging a sleeping baby, diaper bag and souvenirs! The basket under the stroller will be great for storage. If you’d rather rent a stroller, Disneyland Parks do have rentals but they are suited more for toddlers than small babies. Also you cannot remove the strollers from the Parks. If your baby is accustomed to being held in a front carrier, feel free to bring that with you into the parks as well. I love that I’m able to baby-wear on many of the attractions, so my daughter can nap while we ride! Pack your diaper bag with everything you would for a normal outing including food and snacks and plenty of diapers and wipes. You can buy some things in the Parks but the price will be at a premium. 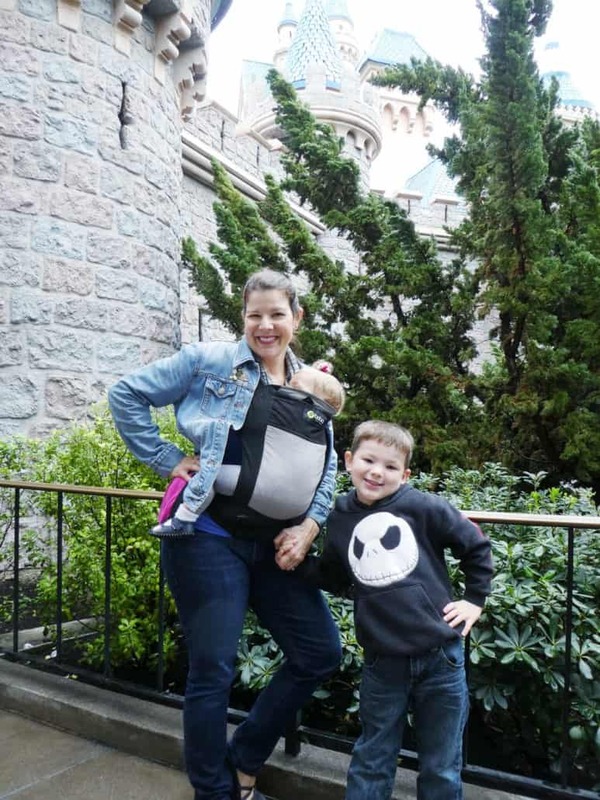 See this post with my advice for packing the perfect Disneyland diaper bag. Out and about in the Parks, there are quiet rest areas and benches where you can sit and feed or nurse your baby. Bathrooms have ample diaper changing stations but they aren’t padded, so be sure to bring your own changing pad that you can wipe down after each use. 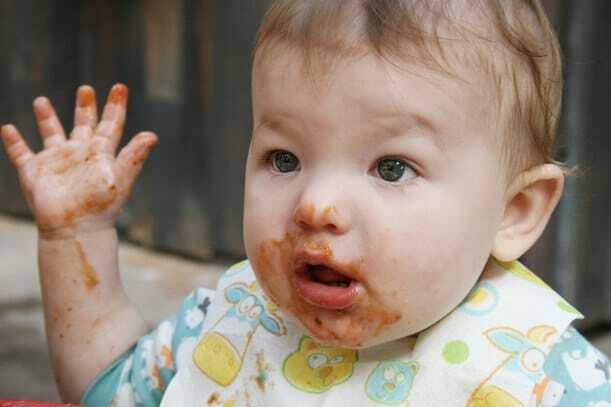 If baby is eating solids, bring your own spoons and baby food jars. I also bring disposable bibs because I’d rather not have messy clothes or food-crusted bibs to tote around. To hold snacks and formula, I recommend the Munchkin Formula Dispenser . It holds one bottle’s worth of formula in each section but it’s also a good size for shaking out bite-sized snacks like puffs and Cheerios. 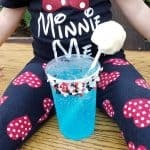 Read this post with more ideas on how to feed your baby at Disneyland. Bring a lightweight blanket (like the aden + anais Disney Baby swaddle cloths ) to drape over your baby to protect them from the sun. I highly recommend visiting the Disneyland Baby Care Center. There is one located inside each of the two parks. There are rocking chairs, microwaves for heating jarred food, high chairs and changing tables. If you’ve run out of diapers (like we did once) you can purchase them here and clean up baby after a nasty blow out (like we did!) The cast members here are sweeter than sweet about helping you! My baby daughter likes to sleep in the front carrier at Disneyland. 4. 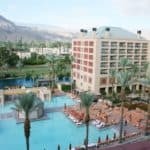 Should We Hold Off Disney Vacation Plans Until Our Baby is Older? Absolutely not! There is no reason to wait for a certain age because Disneyland is a place for all ages. Going to Disney with a baby is going to be a different experience but not one to miss! Especially when you see them in Mouse Ears for the first time or take them on their first it’s a small world boat ride! BONUS QUESTION- At What Age Do Kids Get in for Free to Disneyland? Kids two-years old and under do not need a Park ticket, so your baby has free admission! 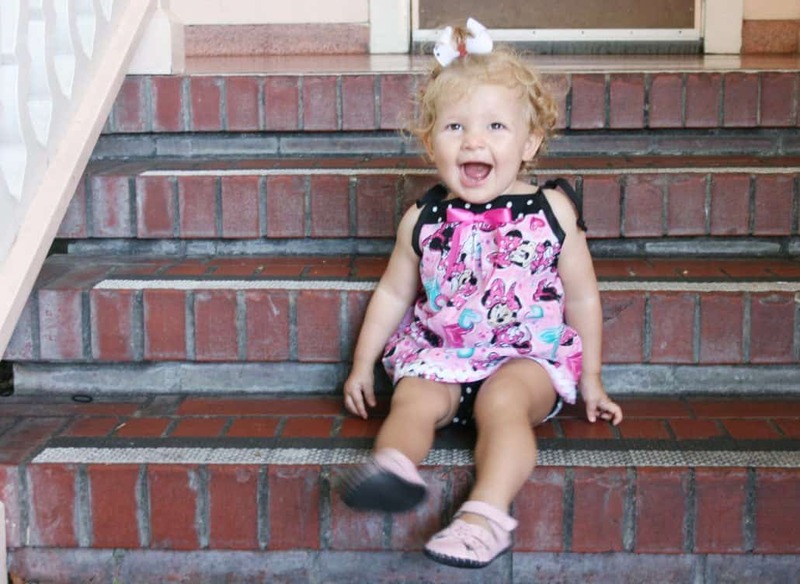 You won’t need to buy your baby a Disneyland ticket until their third birthday. 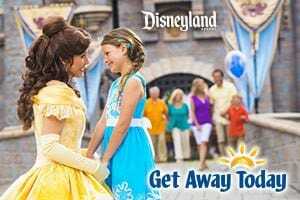 I recommend purchasing your tickets ahead of time through my travel partner Get Away Today. You’ll save a few dollars off the cost as well as save time standing in line at the gate. Taking your Toddler to Disneyland? 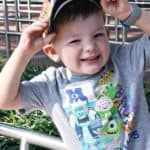 Check out this post with a one-day itinerary for Disneyland with toddlers. Have you traveled to Disneyland with your baby? 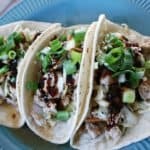 What other tips or advice do you have to share? Please comment below, thanks! Adorable! Your baby may not remember this moment, but YOU certainly will, and I’m sure you will cherish it forever!